For some people Christmas preparation in Malta are an all round activity. The island of Malta follows traditions and religious Christian culture where preparations start from several months before. By June most importers of Christmas decorations would have already decided what to buy from abroad for local sales and by beginning November some shops open their display with new items. The Friends of the Crib Society has for the past 35 years organised courses on how to build your own crib. Wherever Christmas is celebrated there is a crib, in churches and houses. By October of every year shops start exhibiting statuettes, known in Maltese as ‘pasturi', derived from the Italian word ‘pastore’ which means shepherd. Streets landscaped areas are decorated by mid-November. Many village centres are also decorated including the parish church. Most people truly celebrate Christmas in their home and there are those who start decorating their houses by September covering every inch of their house with some sort of Christmas themed decoration. These houses are a hive of decorations from lights, cribs, Father Christmas and tinsil. But the majority of homeowners start decorating their homes by end November, beginning December. It has become a solid tradition that all houses have a Christmas tree with a variety of decorations from different countries. The Maltese have a tradition of decorating their homes, balconies, windows and front gardens with Christmas trees, twinkling starts, baby Jesus or with colourful lights. Restaurants and hotels start rolling out their menus and sleep over offers very early on. Not least, families start preparing and organizing parties and the much awaited Christmas and new year's day lunch at each other houses, inviting all the family and relatives for an enjoyable day together. Schools play an important role in Christmas preparations. Children are given the opportunity to express their talents whilst at the same time enhancing their religious and cultural awareness. All schools at all levels prepare activities like crib competitions, class decorations, carol singing, plays with different themes. Those schools who have a hall, from months before prepare musicals, plays, carol singing where they invite all the parents to participate. These occasions create opportunities which serve to continue to strengthen the sense of community. In olden times the Christmas festivities were confined to church functions not only in Malta but everywhere. The big change in development and tourism has changed all this. Nowadays we have many opportunities where to meet and celebrate. These organisations are all engaged in creating those activities that enhance the spirit of feasting, engaging youths and adults in offering their time to create activities for others. For those who can be in Malta during these times, it is not difficult to see on newspapers, news, and through facebook, the many opportunities for everyone to engage in and enjoy these functions. 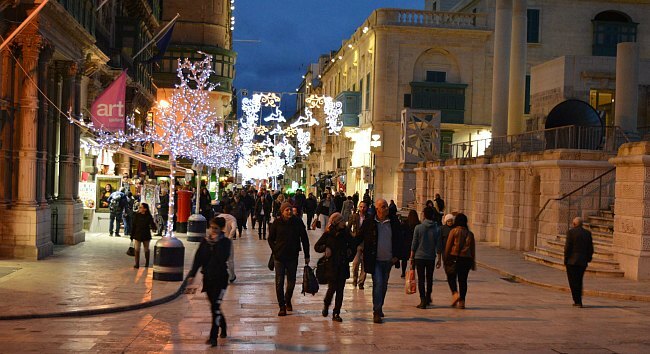 Christmas preparations in Malta succeed to help everyone to forget all that divides and instills that positive feeling that should be felt all thoughout the year. For purchases contact directly Rose Caruana.